YOUNGSVILLE – A team of first responders in Franklin County, used to saving lives, are dealing with a tragedy of their own this holiday weekend. WILSON – Wilson Fire Rescue Services firefighters battled flames twice in one morning at the McDonald’s located at 5028 Raleigh Road Parkway. WAKE COUNTY – We regret to announce the loss of Cary Fire Captain Jon Schondelmayer who died on Wednesday, December 18, 2013. Arrangements have been posted. ROCKY MOUNT – Just after 18:00 hours on December 13, Rocky Mount firefighters were dispatched to a reported dwelling fire in the 300 block of Rose Street. ROWAN COUNTY – Rowan-Cabarrus Community College unveiled its new fire and emergency services training facility. ROBESON COUNTY – A Robeson County volunteer firefighter died Sunday after a sudden illness. Arrangements have been posted. ASHEVILLE – A demolition crew working to tear down an old school inadvertently sparked a massive fire Tuesday. 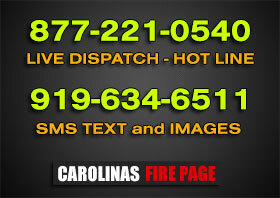 FAYETTEVILLE – Florist Teresa Del Pizzo was out making deliveries when she got the call that her shop was on fire.